Mountain West Partnership localities pride themselves on working together with the State of North Carolina to craft competitive incentive packages that are tailored to meet your company’s needs. Click on a Mountain West county below in order to learn more about the unique local incentive packages each has to offer, or contact the county's economic developer (map), to begin putting together the best economic development incentive package available to your company. To check for loan availability for your new or expanding business, visit our Resource Directory. Cherokee County offers an Economic Development Grant, which is a tax-based grant (or tax grant) worth up to 85% of taxes paid to the County for up to 5 years. The award and amount of the grant are at the discretion of the County Board of Commissioners. To receive an Economic Development Grant, a minimum 5 jobs must be created and a capital investment of at least $2 million must be made in the County. If the capital investment is above $15 million, no job creation is required. Award of a County Economic Development Grant is governed by the County's Incentive Policy. In addition to the Economic Development Grant, the County may use a North Carolina Building Reuse Grant to renovate or retrofit an existing industrial building for a company's use and/or may apply to the State for a Community Development Block Grant, Industrial Development Fund Grant, or Road and Rail Access Fund Grant in order to make infrastructure improvements to attract new jobs and investment to the County. Contact Cherokee County's Economic Development Director to inquire about the County's local incentives. Clay County offers a grant from the Clay County Economic Development Commission. To receive this grant, a business must create at least 5 new full-time jobs that pay at least the County's average wage. The award and amount of the grant are at the discretion of the Clay County Economic Development Commission. In addition to this grant, the County may use a North Carolina Building Reuse Grant to renovate or retrofit an existing industrial building for a company's use and/or may apply to the State for a Community Development Block Grant, Industrial Development Fund Grant, or Road and Rail Access Fund Grant in order to make infrastructure improvements to attract new jobs and investment to the County. Contact Clay County's Economic Development Director to inquire about the County's local incentives. Graham County has economic development incentives for small and large projects. Graham County Starter Grants are grants made for small projects benefiting Graham County's economy. There is no job creation requirement but any existing jobs must be retained by the company. The maximum Starter Grant is $4,500, based on the size of the grant pool at the time an application is made. Grant awards are made in March and October of each year. Graham County also offers a discretionary grant to attract a larger business or business expansion to the County. This grant is a tax-based grant (or tax grant) and will generally be used to match a grant from the One North Carolina Fund. In addition to this discretionary grant, the County may use a North Carolina Building Reuse Grant to renovate or retrofit an existing industrial building for a company's use and/or may apply to the State for a Community Development Block Grant, Industrial Development Fund Grant, or Road and Rail Access Fund Grant in order to make infrastructure improvements to attract new jobs and investment to the County. Contact Graham County's Economic Development Director to inquire about the County's local incentives. Haywood County offers an Industrial Development Incentive Grant, a tax grant equal to a percentage of annual local property taxes. The Incentive Grant is paid over 5 consecutive years upon certification by the County's Board of Commissioners that the quantity and quality of jobs is in the best interest of the County. Generally, companies must be industrial, manufacturing or in the renewable energy field (job creation may be waived for a renewable energy project). The award and amount of the Incentive Grant are determined at the discretion of the County based on the number of jobs created and the amount of private investment in the County. Policy guidance for the amount of the Incentive Grant to be awarded is shown in the table, below. To receive the Incentive Grant, a performance agreement must be signed by the business and the County. In addition to the Industrial Development Incentive Grant, Haywood County may use a North Carolina Building Reuse Grant to renovate or retrofit an existing industrial building for a company's use and/or may apply to the State for a Community Development Block Grant, Industrial Development Fund Grant, or Road and Rail Access Fund Grant in order to make infrastructure improvements to attract new jobs and investment to the County. Contact Haywood County's Economic Development Director to inquire about the County's local incentives. Jackson County can offer one of two economic development incentives to attract new businesses and business expansions to Jackson County. The County's Economic Development Incentive Program is a tax-based grant (or tax grant) awarded at the discretion of the County. This is a "deal closing" incentive and a business must demonstrate that it would not locate or expand in the County "but for" this incentive. Policy guidance with regard to the Economic Development Incentive Program is shown in the table below. This incentive is also tax-based, with the amount and award made at the discretion of the County. In determining the amount and structure of the Discretionary Economic Incentive, the County may take into consideration the number of new jobs, average wages, the amount of capital investment, the ratio of real vs. personal property investment, the project's contribution to industry diversification, the potential for future expansion, the need for additional public infrastructure, and the project's alignment with County and regional economic development goals. This incentive may include: cash, a revolving loan fund loan, site preparation and development, public infrastructure provision including utilities, deconstruction and reuse assistance, grant partnership and matching funds, workforce development and training assistance coordination, favorable lease or purchase terms of County-owned sites, grants to subsidize water and sewer connection fees, and other incentives as needed. Prior to awarding this incentive, the County's Economic Development Director and the company will identify the company's needs. The Director will then discuss the project with the Economic Development Advisory Committee and make a recommendation to the County Commission, which makes the final decision. 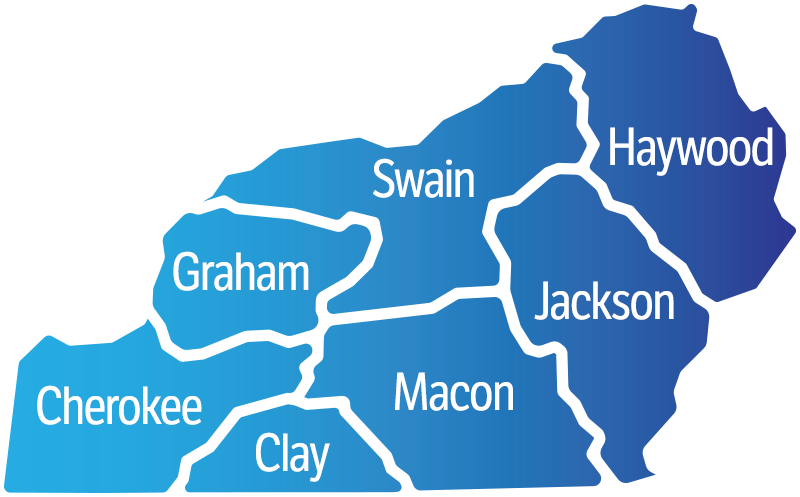 In addition to the Economic Development Incentive Program and the Discretionary Grant, Jackson County may use a North Carolina Building Reuse Grant to renovate or retrofit an existing industrial building for a company's use and/or may apply to the State for a Community Development Block Grant, Industrial Development Fund Grant, or Road and Rail Access Fund Grant in order to make infrastructure improvements to attract new jobs and investment to the County. The County also offers business loans to help finance small to mid-size business start-ups and expansions. Contact Jackson County's Economic Development Director to inquire about the County's local incentives. Macon County offers an Economic Development Grant at the discretion of the County. The County may offer the Economic Development Grant to a company investing at least $1 million in Macon County and creating jobs that pay at or above the County's median wage and that offer health benefits. The Grant amount is dependent on the number and quality of jobs created or retained. A performance agreement must be signed by the recipient and the County. Not all projects are eligible for the Grant. (See the County's incentive policy for a full list). In addition to the Economic Development Grant, Macon County may use a North Carolina Building Reuse Grant to renovate or retrofit an existing industrial building for a company's use and/or may apply to the State for a Community Development Block Grant, Industrial Development Fund Grant, or Road and Rail Access Fund Grant in order to make infrastructure improvements to attract new jobs and investment to the County. Contact Macon County's Economic Development Director to inquire about the County's local incentives. Swain County may make an economic development incentive available to a new or expanding business in Swain County on a discretionary basis. The County may also use a North Carolina Building Reuse Grant to renovate or retrofit an existing industrial building for a company's use and/or may apply to the State for a Community Development Block Grant, Industrial Development Fund Grant, or Road and Rail Access Fund Grant in order to make infrastructure improvements to attract new jobs and investment to Swain County. Contact Swain County's Economic Development Director to inquire about the County's local incentives. State incentives include grants from the One North Carolina Fund, Job Development Investment Grants, Building Reuse Grants, Technology Development Tax Credits, Small Business Technology Funding and the Interactive Digital Media Tax Credit. State incentives for job training include Incumbent Worker Grants and the Work Opportunity Tax Credit. The Recycling Business Assistance Grant is an incentive administered by the North Carolina Department of Environmental Quality.